Aldo Palazzeschi (1885-1974) is arguably the major twentieth-century Italian writer who has been most neglected by the English-speaking world. Born in Florence and trained as an actor, Palazzeschi ranks high as a poet and fiction writer in his homeland. His work, which attempts to recreate the experience of a spectator watching and listening to a character on stage, won him the praise of F.T. Marinetti, the founder of Italian futurism, who enrolled the young poet in his avant-garde coterie despite the fact that, stylistically, Palazzeschi's work had little in common with futurism. 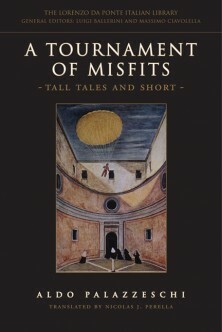 A Tournament of Misfits brings together a selection of Palazzeschi's short fiction for the first time in English. Through clear and fluid translations, Nicolas J. Perella demonstrates Palazzeschi's use of laughter to debunk social and literary myths. As a social being, Palazzeschi felt himself a deviant, but he was saved from a self-destructive bitterness by his capacity for irony, which he often directed at himself as well as at others. Yet, it would be a mistake not to see the desperate yearning for liberation from society's rigid code behind the irony and the fun in Palazzeschi's work. With this translation, Perella brings Palazzeschi to life for a new audience to appreciate.